Nicolas Steno was born in Copenhagen on New Year's Day 1638 (Julian calendar), the son of a Lutheran goldsmith who worked regularly for King Christian IV of Denmark. He became ill at age three, suffering from an unknown disease, and grew up in isolation during his childhood. In 1644 his father died, after which his mother married another goldsmith. In 1654–1655, 240 pupils of his school died due to the plague. Across the street lived Peder Schumacher (who would offer Steno a post as professor in Copenhagen in 1671). At the age of 19, Steno entered the University of Copenhagen to pursue medical studies. After completing his university education, Steno set out to travel through Europe; in fact, he would be on the move for the rest of his life. In the Netherlands, France, Italy and Germany he came into contact with prominent physicians and scientists. These influences led him to use his own powers of observation to make important scientific discoveries. At the urging of Thomas Bartholin, Steno first travelled to Rostock, then to Amsterdam, where he studied anatomy under and lodged with Gerard Blasius, focusing on the lymphatic system. Within a few months Steno moved to Leiden, where he met the students Jan Swammerdam, Frederik Ruysch, Reinier de Graaf, Franciscus de le Boe Sylvius, a famous professor, and Baruch Spinoza. At the time Descartes was publishing on the working of the brain, and Steno doubted Descartes's explanation of the origin of tears  as produced by the brain. Invited to Paris by Henri Louis Habert de Montmor and Pierre Bourdelot, he there met Ole Borch and Melchisédech Thévenot who were interested in new research and in demonstrations of his skills. In 1665 Steno travelled to Saumur, Bordeaux and Montpellier, where he met Martin Lister and William Croone, who introduced Steno's work to the Royal Society. During his stay in Amsterdam, Steno discovered a previously undescribed structure, the " ductus stenonianus " (the duct of the parotid salivary gland) in sheep, dog and rabbit heads. A dispute with Blasius over credit for the discovery arose, but Steno's name remained associated with this structure known today as the Stensen's duct. In Leiden, Steno studied the boiled heart of a cow, and determined that it was an ordinary muscle   and not the center of warmth as Galenus and Descartes believed. Steno was the first to describe the lateral line system in fishes. In October 1666 two fishermen caught a huge female shark near the town of Livorno, and Ferdinando II de' Medici, Grand Duke of Tuscany, ordered its head to be sent to Steno. Steno dissected the head and published his findings in 1667. He noted that the shark's teeth bore a striking resemblance to certain stony objects, found embedded within rock formations, that his learned contemporaries were calling glossopetrae or "tongue stones". Ancient authorities, such as the Roman author Pliny the Elder, in his Naturalis Historia , had suggested that these stones fell from the sky or from the Moon. Others were of the opinion, also following ancient authors, that fossils naturally grew in the rocks. Steno's contemporary Athanasius Kircher, for example, attributed fossils to a "lapidifying virtue diffused through the whole body of the geocosm", considered an inherent characteristic of the earth – an Aristotelian approach. 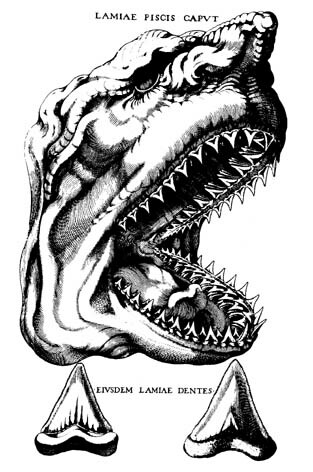 Fabio Colonna, however, had already shown in a convincing way that glossopetrae are shark teeth,  in his treatise De glossopetris dissertatio published in 1616. Steno added to Colonna's theory a discussion on the differences in composition between glossopetrae and living sharks' teeth, arguing that the chemical composition of fossils could be altered without changing their form, using the contemporary corpuscular theory of matter. Steno's work on shark teeth led him to the question of how any solid object could come to be found inside another solid object, such as a rock or a layer of rock. The "solid bodies within solids" that attracted Steno's interest included not only fossils, as we would define them today, but minerals, crystals, encrustations, veins, and even entire rock layers or strata. He published his geologic studies in De solido intra solidum naturaliter contento dissertationis prodromus, or Preliminary discourse to a dissertation on a solid body naturally contained within a solid in 1669. This book was his last scientific work of note. [notes 3] Steno was not the first to identify fossils as being from living organisms; his contemporaries Robert Hooke and John Ray, as well as Leonardo da Vinci a century earlier also argued that fossils were the remains of once-living organisms[ citation needed ]. Steno gave the first accurate observations on a type of crystal in his 1669 book "De solido intra solidum naturaliter contento". The principle in crystallography, known simply as Steno's law, or Steno's law of constant angles or the first law of crystallography,  states that the angles between corresponding faces on crystals are the same for all specimens of the same mineral. Steno's seminal work paved the way for the law of the rationality of the crystallographic indices of French mineralogist René-Just Haüy in 1801. This fundamental breakthrough formed the basis of all subsequent inquiries into crystal structure. It is not clear if he met Nicolaes Witsen, but he did read Witsen's book on shipbuilding. In 1671 he accepted the post of professor of anatomy in the University of Copenhagen,  but promised Cosimo III de' Medici he would return when he was appointed tutor to Ferdinando III de' Medici. In the year after he was made bishop, he was probably involved in the banning of publications by Spinoza,  There he had talks with Gottfried Leibniz, the librarian; the two argued about Spinoza and his letter to Albert Burgh, then Steno's pupil. Leibniz recommended a reunification of the churches. Steno worked at the city of Hannover until 1680. The Steno Museum in Aarhus, Denmark, named after Nicolas Steno, holds exhibitions on the history of science and medicine. It also operates a planetarium, a medicinal herb garden and the greenhouses in Aarhus Botanical Gardens. Impact craters on Mars ( 68°00′S115°36′W﻿ / ﻿68.0°S 115.6°W﻿ / -68.0; -115.6﻿ (Steno) ) and the Moon are named in his honor. ↑ On the other days there were never more than four courses plus a dessert, even though noblemen from the court often dined with him. ↑ Janker, Stephan M. (1990). Die Bischöfe des Heiligen Römischen Reiches : ein biographisches Lexikon (in German). Berlin: Duncker und Humblot. p. 516. ISBN 978-3-428-06763-3. ↑ Pope John XXIII (26 May 1960). "Canonizzazione di S. Gregorio Barbarigo". Homily of His Holiness Pope John XXIII (in Italian). Holy See. Retrieved 14 January 2012. 1 2 Hansen, Niels (1912). "Nicolaus Steno". In Herbermann, Charles. Catholic Encyclopedia . 14. New York: Robert Appleton Company. ↑ History of Geology – Steno – Aber, James S. 2007. Retrieved 11 January 2012. ↑ Office Of Papal Liturgical Celebrations. "Beatifications By Pope John Paul II, 1979–2000". Holy See. Retrieved 11 January 2012. ↑ René, Descartes. "The Origin of Tears" (PDF). The Passions of the Soul. Jonathan Bennett. Retrieved 11 January 2012. 1 2 Chisholm, Hugh, ed. (1911). "Steno, Nicolaus". Encyclopædia Britannica . 25 (11th ed.). Cambridge University Press. p. 879. ↑ Kooijmans, L. (2007) Gevaarlijke kennis, p. 99-100. ↑ Kooijmans (2007), p. 45. ↑ Molčanov, K.; Stilinović, V. (2014). "Chemical Crystallography before X-ray Diffraction". Angew. Chem. Int. Ed. 53 (3): 638–652. doi:10.1002/anie.201301319. ↑ "Stephen A. Nelson, (Tulane U.) "Introduction to Earth Materials"" (PDF). Retrieved 11 January 2012. 1 2 3 "Bishop Bl. Niels Stensen". Catholic Hierarchy. Retrieved 11 January 2012. ↑ "Niels Stensen". Whonamedit? A dictionary of medical eponyms. Retrieved 11 January 2011. ↑ "Pulchra sunt, quae videntur pulchriora quae sciuntur longe pulcherrima quae ignorantur. From a 1673 speech for the Copenhagen Anatomical Theatre". Stenomuseet.dk. Archived from the original on 20 March 2012. Retrieved 11 January 2012. ↑ "Skeptic files website". Skepticfiles.org. Retrieved 11 January 2012. ↑ "Niels Stensen chapel in San Lorenzo – Himetop". Himetop.wikidot.com. 21 March 2010. Retrieved 11 January 2012. ↑ "The Steno Museum – Welcome". Stenomuseet.dk. Archived from the original on 20 March 2012. Retrieved 11 January 2012. ↑ "Niels-Stensen-Kirche Grevesmühlen" (in German). Retrieved 12 January 2012. ↑ "Niels Steensens Gymnasium" (in Danish). Retrieved 12 January 2012. ↑ Hom, Jennifer (2012). "Nicolas Steno's 374th Birthday". Doodles. Google. Retrieved 12 January 2012. ↑ O'Carroll, Eoin (11 January 2012). "Nicolas Steno: The saint who undermined creationism". Christian Science Monitor . Retrieved 11 January 2012. ↑ Cavna, Michael (11 January 2012). "Nicolas Steno Google Doodle: Logo digs deep to celebrate Danish 'father of geology'". Washington Post. Retrieved 11 January 2012. Kermit, Hans (2002). "The Life of Niels Stensen". In Ascani, Karen; Kermit, Hans; Skytte, Gunver. Niccolò Stenone (1638–1686) : anatomista, geologo, vescovo ; atti del seminario organizzato da Universitetsbiblioteket i Tromsø e l'Accademia de Danimarca, lunedì 23 ottobre 2000. Roma: "L'Erma" di Bretschneider. ISBN 978-88-8265-213-5 . Retrieved 10 January 2012. Kardel, Troels (1994). "Stensen's Myology in Historical Perspective" (PDF). Transactions of the American Philosophical Society. 84 (1): 1–57. doi:10.2307/1006586. JSTOR 1006586 . Retrieved 12 January 2012. Brookfield, Michael E. (2004). Principles of stratigraphy. Malden, Mass. : Blackwell Publ. ISBN 978-1-4051-1164-5 . Retrieved 12 November 2014. Hansen, Niels (1912). "Nicolaus Steno". In Herbermann, Charles. Catholic Encyclopedia . 14. New York: Robert Appleton Company. Chisholm, Hugh, ed. (1911). "Steno, Nicolaus". Encyclopædia Britannica . 25 (11th ed.). Cambridge University Press. p. 879. Scherz, G. (2002). "Stensen, Niels, Bl.". In Catholic University of America. The New Catholic Encyclopedia. Volume 13 – Seq to The. Catholic University Press/Thomas Gale. pp. 508–509. ISBN 0-7876-4017-4. Cutler, Alan (2003). The Seashell on the Mountaintop: A Story of Science, Sainthood, and the Humble Genius Who Discovered a New History of the Earth. New York: Dutton. ISBN 0-525-94708-6. Kermit, Hans (2003). Niels Stensen, 1638–1686: The Scientist Who Was Beatified. Leominster, UK: Gracewing. pp. 82–83. ISBN 0-85244-583-0 . Retrieved 18 February 2008. Kooijmans, Luuc (2004). De doodskunstenaar — de anatomische lessen van Frederik Ruysch (in Dutch). Amsterdam: Bert Bakker. ISBN 978-90-351-2673-2 . Retrieved 10 January 2012. Kraus, Max-Joseph (2011). Niels Stensen in Leiden (in German). Munich: GRIN Verlag GmbH. ISBN 978-3-640-86454-6 . Retrieved 11 January 2012. Miniati, Stefano (2009). Nicholas Steno's challenge for Truth. Reconciling science and faith. FrancoAngeli. ISBN 88-568-2065-X. Tubbs, R. Shane; Mortazavi, Martin M.; Shoja, Mohammadali M.; Loukas, Marios; Cohen Gadol, Aaron A. (2010). "The bishop and anatomist Niels Stensen (1638–1686) and his contributions to our early understanding of the brain". Child's Nervous System (in Dutch). 27: 1–6. doi:10.1007/s00381-010-1236-5. Sobiech, Frank (2009). "Nicholas Steno's way from experience to faith: Geological evolution and the original sin of mankind". In Rosenberg, Gary D. The Revolution in Geology from the Renaissance to the Enlightenment (GSM). Boulder, Co: Geological Society of America. pp. 179–186. ISBN 978-0-8137-1203-1. Hansen, Jens Morten (2009). "On the origin of natural history: Steno's modern, but forgotten philosophy of science". In Rosenberg, Gary D. The Revolution in Geology from the Renaissance to the Enlightenment (GSM). Boulder, Co: Geological Society of America. pp. 159–178. ISBN 978-0-8137-1203-1. Woods, Thomas E. (2005). How the Catholic Church built Western civilization. Washington, D.C.: Regnery Publ. ISBN 0-89526-038-7. Porter, Ian Herbert (1963). "Thomas Bartholin (1616–80) And Niels Steensen (1638–86) Master And Pupil". Medical History. 7 (2): 99–125. doi:10.1017/s0025727300028155. PMC 1034806 . PMID 13985566.